Top-up Crisis Action! Cross-platform payment solution for both iOS and Android. You can now buy diamonds online, and pay using GCash, Bank Transfer, 7-Eleven, Robinsons and Bayad centers. There's no credit card, registration or login required, and the diamonds will be added in your game account immediately after you complete the payment. It's the best way to top-up your Crisis Action account online without a credit card. 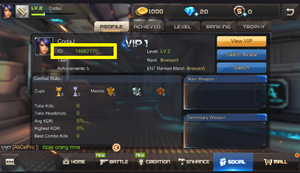 To find your User ID, click on your avatar in the top left corner of the main game screen. Then go to the "Basic Info" tab. Your user ID is shown below your nickname. Buy Crisis Action Diamonds online with no credit card! You're just seconds away from buying diamonds for Crisis Action! To complete your purchase, simply choose the diamonds that you want, and the payment channel through which you'd like to pay, and then enter your email address. You'll then be asked to complete the payment, and after doing so the top up information will be automatically emailed to you. You will receive your diamonds in your game. NO CA NO FPS - Crisis Action is the best FREE eSports FPS mobile game with classic CS modes. Real-time match and various gameplay give you a perfect shooting experience. Hundreds of guns and props show off your shooting skill and arm you to be invincible. Now 50 million shooters are playing online.